All our employees are CPSI certified playground inspectors. 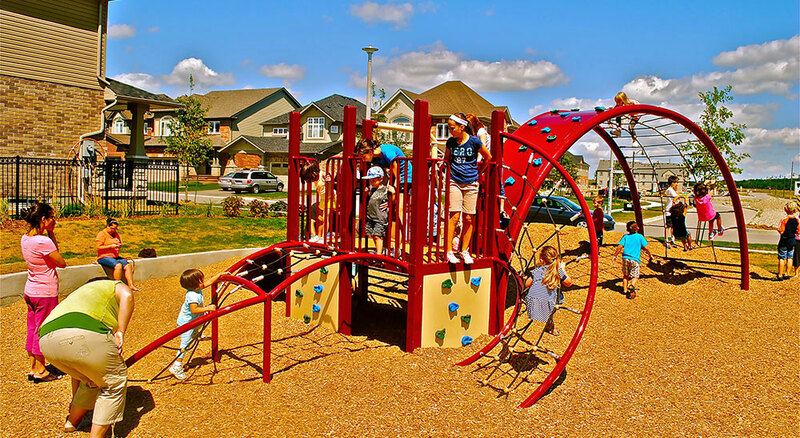 The Canadian Parks and Recreation Association (CPRA) offers the Canadian Certified Playground Inspector certification program through the Canadian Playground Safety Institute (CPSI). Only individuals who complete the CPSI Theory and CPSI Practical courses and achieve passing grades on both exams are considered to be Canadian Certified Playground Inspectors. The following equipment inspection and maintenance advice will reduce the incidence of playground-related injuries. Hard surfaces, such as asphalt, concrete and blacktop, are never truly safe. Packed-earth and grass can also be unsafe because wear and weather can reduce their ability to soften a child’s fall. More acceptable surface materials include wood chips, mulch, shredded rubber, pea gravel, sand, and safety-tested rubber mats. 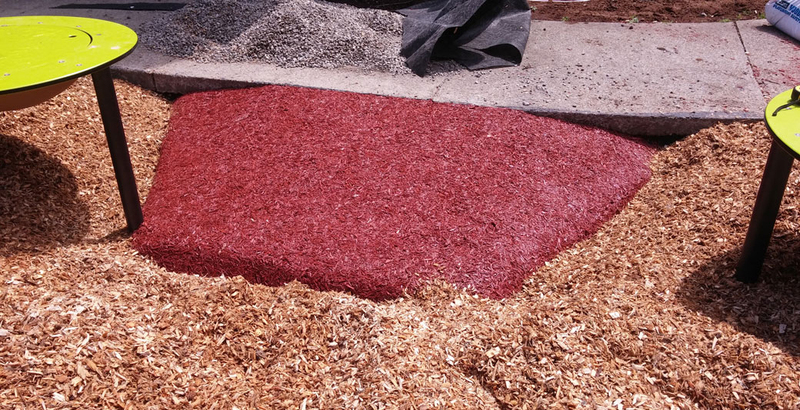 Of these options, wood chips and rubber mats allow the best wheelchair accessibility. Even the best surface materials are unsafe for falls greater than 12 feet. The cushioned ground surface must extend at least 6 feet beyond the perimeter of all equipment. 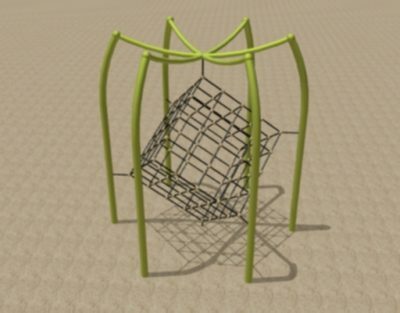 Certain playground structures, such as swings and slides, may require an even greater protective perimeter. Surfaces should be free from items and debris, such as toys, tree roots and rocks, which may cause a child to trip and fall. Standing water can also cause dangerous slips. Playgrounds should be maintained to remove dangerous debris, such as broken glass, sharp sticks and twisted metal, which may injure a child if he falls on them. 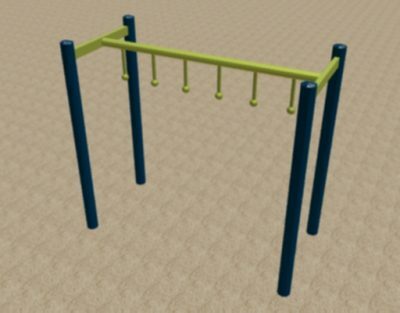 At least 9 feet of spacing is required for playground equipment taller than 30 inches. 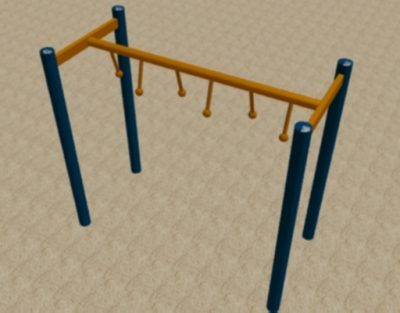 Equipment with moving parts, such as see-saws, merry-go-rounds and swings, should be located in a separate area of the playground. Such equipment should also be inspected for pinch points that may crush a child’s hand or finger. 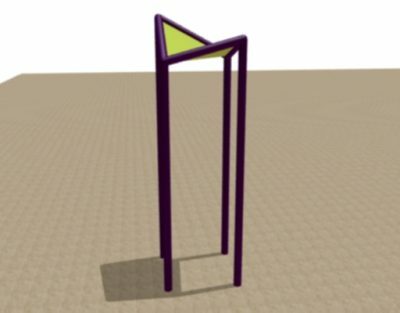 Swings should be spaced at least 24 inches apart and at least 30 inches from the support frame. Tot swings should have full-bucket seats and their own bay. Beware of spaces that may allow entrapment of limbs. 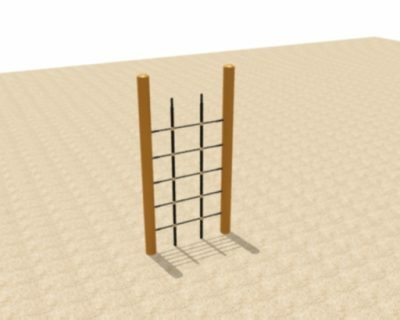 Ladder rungs, for instance, should be less than 3½ inches or greater than 9 inches apart. Equipment designed for younger children should be clearly separated from equipment meant for older children. Older children may be injured when they try to fit into equipment intended for younger children, just as small children lack the physical proportions necessary to be protected while using equipment intended for larger, older children. No damaged parts should be observable. Inspect wooden equipment for splintering or cracking, and check metal equipment for rust. Materials should be durable and resistant to weathering and abuse. If a part is loose, broken or in need of maintenance, designate the equipment off-limits and report the problem to whoever is responsible for maintaining the equipment. The fence that separates the playground from nearby traffic should be in good condition, with no unintended openings. There should be no protruding objects with sharp, unfinished or otherwise awkward edges, such as bolts or S-shaped hooks that could cut a child or catch or become entangled with their clothing. Surface material should be free from animal droppings. A cover can be used at night to prevent birds, cats and other animals from using a child’s sandbox as a litter box. Protective barriers, such as guardrails or walls, should be installed on elevated surfaces, including ramps and platforms. This Standard applies to (a) public-use playspaces built, protective surfacing installed, and public-use playground equipment manufactured after the date of publication of this edition; and (b) additions to, and replacement parts for, public-use playspaces installed after the date of publication of this edition. Visual inspection shall be performed by the owner, maintenance inspector, caregiver, or custodian on a daily basis, if possible, or at least once a week, to identify defects or emerging problems. A detailed inspection shall be performed every month, and the results and actions taken shall be entered in a permanent record available for examination. Every year, a comprehensive written report shall be completed by the owner/operator or it’s designate. A record of any injuries reported to have occurred on the playground shall also be collected. This will help identify potential hazards or dangerous design features that warrant attention. A structure consisting of 4 decks, 2 slides, 3 climbers and a staircase would comprise the following typical time and material costs. 15 minutes average inspection time x avg. $80.00/hour = $20.00 Multiplied by 50 parks = $1000.00/month. 60 minutes average inspection time x avg. $80.00/hr. = $80.00 Multiplied by 50 parks = $4000.00/month. A difference of $3000.00/month over 12 months = $36,000.00 per year. That’s $720,000 saved over an average 20-year lifespan of a structure! We take the safety of kids using our products very seriously. Each year 20,000 to 30,000 children in Canada are treated in hospital emergency departments for playground injuries, and about 70% of playground injuries occur at public parks and schools. The most common playground injuries that require hospitalization are broken arms (81%) and head injuries (14%), which is why we use only the very best in Engineered Wood Fibers to cushion the landing. There is an increasing awareness of the importance of cushioned play surfaces, with strenuous efforts by the CPSC and others to educate consumers on playground safety. Legislation to mandate performance and accessibility standards has passed in California and is pending elsewhere. Pending changes to ASTM standards will make in-situ testing of installed surfaces possible, rendering the standards enforceable. Over the next few years, many playgrounds with surfaces that do not attenuate impact or are not accessible to wheelchairs will have to be replaced or closed. This includes most surfaces made from organic or inorganic loose fill materials. 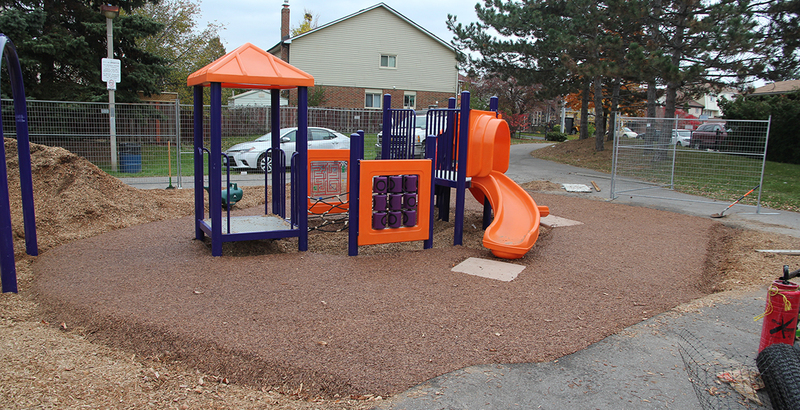 This combination of circumstances creates an opportunity for a replacement surface that is performance and cost competitive with existing unitary playground surface systems.